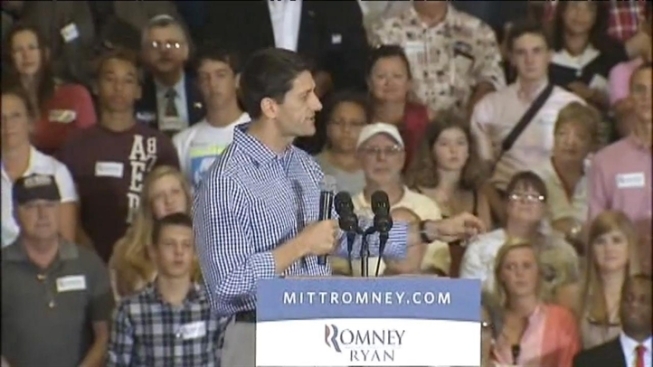 Demonstrating how important Virginia voters will be on Election Day, U.S. Rep. Paul Ryan (R-Wisc.) has spent more days in the commonwealth than any other battleground state since presidential candidate Mitt Romney announced him as his running mate. Ryan held a rally in Glen Allen near Richmond Friday morning before heading to an event at West Springfield High School in Fairfax County. With the tens of thousands of defense jobs at stake with the automatic budget cuts of sequestration looming at the end of the year, Ryan said a Romney-Ryan administration would stand with the House against them. “In the House, we already passed the bill to cut spending in other areas of government to make sure that these devastating cuts to defense never occur so we don’t put Virginians out of work and so we have a strong national defense,” Ryan said. Ryan stuck to broad themes and tried to turn the focus back on the economy, promising to cut taxes to create jobs.